To ensure the most efficient scheduling possible, WPVC books appointments Monday - Friday from 8am. - 2pm., and 3:00pm. - 6:20pm. Saturday from 8am. - 11:20am. It is highly recommended that clients call in advance to schedule routine visits such as annual exams, vaccinations, and health certification for travel. Regularly scheduled appointments allow our staff to maintain an on time schedule, while handling the needs of hospitalized patients and client requests in an efficient and organized manner. However, even though we prefer to see clients by appointment, we will see walk-in clients as long as they understand that they will need to be worked into our current schedule. Walk-In appointments will be charged an additional $17.50 to the price of a scheduled examination, and may need to wait as those clients with emergencies and scheduled appointments will have priority. Walk in emergencies during normal business hours will be seen immediately! We ask that clients that have a scheduled appointment be understanding when emergencies disrupt our appointment schedule. For your convenience, "drop-off" appointments are available. A "drop off" means you may bring your pet at the time that works best for you and leave him/her with us for a couple of hours. Usually we will ask you to "drop off" sometime in the morning so our doctors can examine the patient in between scheduled appointments or at the time purposely reserved for admitted patients. Once the doctor is done, she will give you a call to go over the diagnosis and to give you discharge instructions. For the safety of all animals in our care, we require that all vaccinations be up to date. Even though we make every effort to have our patients feel comfortable during visits, they may be a little uneasy about new people, new surroundings and other pets. This is one of the reasons we ask you to restrain your pet. We recommend that animals be placed on a leash or in pet carriers before entering the waiting room. We require full payment at the time the services are rendered. 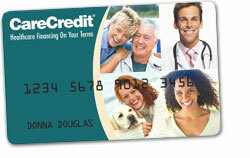 For your convenience, we accept Visa, MasterCard, Discover, Amex, Care Credit and cash. We apologize for any inconvenience, but we are unable to accept personal checks. There is an annual interest charge of 21% and a monthly billing fee of $1.00 on all balances unpaid after 30 days unless previous arrangements have been made. A credit card for my pet? Well, yes, for his healthcare needs — and yours too. CareCredit is designed for healthcare expenses only, and every time you use it you enjoy No Interest financing* for at least three months.You can use the card over and over either for follow-up visits with your veterinarian or to pursue the pet dentistry you've wanted. Whether it's an everyday checkup, or an emergency surgery, we offer you convenient monthly payment options, so you can worry about the important stuff. You know, like playing fetch and learning new tricks. Apply today and you and your pet will be back on top in no time.